The StreamWeaver Platform is efficiently architected to easily integrate your ecosystem of ITOM tools. Quickly and easily stream your metric, event, log and topology data to and from all your monitoring, management, analytics and visualization tools. For years, organizations have been focused on building a “single pane of glass” (SPOG) to aggregate all of their IT Ops data into one platform. However, a SPOG-oriented architecture cannot achieve the same level of performance as a many-to-many ecosystem, which enables analysis within domain-centric tools. As a result, many organizations are now embracing a best-of-breed approach to data analysis. These teams are realizing that it is more effective to have the right data being communicated between the right tools, in a manner that enables quick insight and action, than to have all data being communicated into a single platform. The question becomes, “how can this be done?” Even though IT organizations now understand the benefits of moving to a many-to-many ecosystem, complexities around implementation can pose daunting hurdles. This process necessitates the creation and maintenance of dozens (and, in some cases, hundreds) of unique integrations between end-points, and requires the real-time streaming of data between domain-specific tools. Difficulties and barriers arise, and these scalable, many-to-many systems often end up doing nothing at all. StreamWeaver has the answer: automate your integrations. 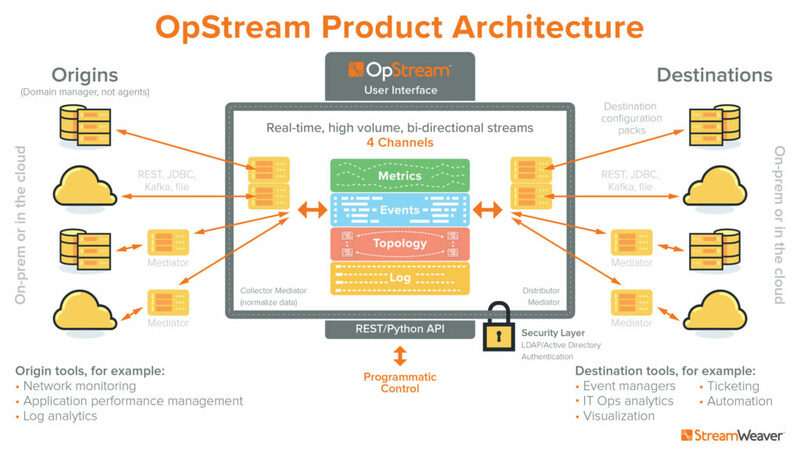 Building off our successful Accelerator technology, StreamWeaver is the industry’s first Enterprise-class monitoring connectivity solution. Built to scale and able to process thousands of messages per second, StreamWeaver can quickly stream all event data to/from all monitoring, management, analytics and visualization tools and quickly exchange your IT Operations data across organizational boundaries. StreamWeaver's distributed processing leverages your existing tool investments, eliminating the need to rip-and-replace within a vendor’s monolithic enterprise platform simply to share valuable IT data. Liberate your IT Ops Data, and let your tools get to work.